Phil Larder coached defence for England during a dominant series of victories including a World Cup. This followed significant success with the defences of the British & Irish Lions and Leicester Tigers. Some say his brand of defence has redefined the way rugby is played. Now for the first time Phil Larder has put his tactical system onto one amazing DVD. Containing drills, strategy and techniques in how to run the infamous “pendulum” defence, this is a must watch for coaches serious about defence. “Phil was the best defensive coach I have ever worked with.” Sir Clive Woodward, World Cup winning head coach of England. 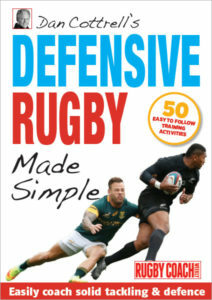 This DVD is a unique insight from one of world rugby’s finest defence coaches into how to turn your defence into a dominant force. This is a thoughtful and straight forward DVD clearly helping coaches understand what and how to structure a team defence from one of the world leaders in his rugby coaching field. "Offensive Defences wins matches".... Phil Larder has proved by his record in both codes of Rugby at the highest levels, that this be the case. This DVD explains his philosophies, principles and methods, in a very understanding and simple manner. Again another coaching tool that all ambitious coaches should possess, highly recommended. Absolute FantasticAbsolute fantastic and educational DVD. Was very informative and will keep on with the training. Very useful DVDDoes exactly what it says on the cover. Must Have DVDI found this invaluable currently coaching rugby here in Spain. Using this system with a few amendments has improved my teams defensive record beyond compare. The DVD is a must have for coaches. Phil Larder's Iron curtain Defence. A must have coaching resource for any coach,easy to follow well explained & put into practice, clear benefits easily identified by the players. Iron Curtain RulesWe have used this DVD at each of the clubs I coached at, with age groups from U12s to U15s and it was easily taken up by players and coaches alike. It was so good for one club they won the county championship 4 years out of 5 and the team that won the 1 year out of 5 only did so when they too took it up as their coaching method of defence. All players involved have gone on to continue to enjoy and play rugby, 4 of whom are now on the Youth Academy of the local Premiership Champions due in part to their advanced understanding of the role of tackling and team work. William BrucePhil Larder's Iron Curtain Defence is to rugby union what Bill Walsh's 'Finding the Winning Edge' is to American Football. It was for me simple to understand, easy to put in practice and easy to build upon. If you are a young coach it is indispensable. If you are an older coach it helps refine your teaching skills. If I were a young coach, this is the first DVD I would purchase. The "Iron Curtain Defence" DVD is an excellent coaching resource. We have used it regularly in 1st XV analysis sessions and the DVD is clear, well presented and a valuable tool for understanding the principles of team defence. It is used by a number of my coaches at our school. I have found the DVD a great help and so easy to use and understand. It has given my players greater confidence, organisation and helped in their understanding of their respective roles on defence. Whilst not winning more games this year, we have closed the gap between us and the bigger teams at such a rate that everyone is talking about us. We even made the local newspapers a few times. Instead of losing by 50 every second week – like last season, we're losing by less than 7 with the same players. All this by simply implementing some of the principles from the DVD. I would recommend it to any coach. My team has put the iron curtain defense to good use. Our overall commitment and organization on defense has improved markedly. It has given us the foundation skills to develop a team defensive program that works for our style of play, skill/experience level and fitness. I would recommend this to any coach who wants a credible defense. Phil Larder is the Man! I highly recommend Phil Larder’s Iron Curtain Defence video. I have employed in with coaches and teachers across a wide age range and found it to be an effective tool to unlock defensive principles and provide both excellent foundational understanding and practical examples of how to set defensive patterns. It empowers both player and coach to recognise potential attacking threats and how to make decisions and provides defensive solutions and options. Phil Larder MBE, is an English rugby league and rugby union coach. Phil Larder coached both England rugby league team at the 1995 World Cup. Phil was also appointed coach of Great Britain and Ireland on their 1996 tour of New Zealand.